Polygon: Polygon is a combination of two Greek words Polus + Gonia, in which Polus means many and Gonia means Corner or angle. Thus, a plane figure bounded by a finite straight line segment in loop to form a closed chain is called a polygon. Polygons are classified as per their sides or vertices they have. 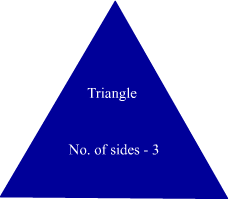 (a) Triangle: A triangle has three sides and three vertices. 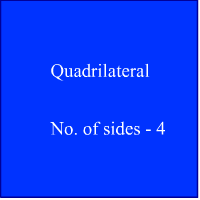 (b) Quardilateral: A quardilateral has four sides and consequetively four vertices. 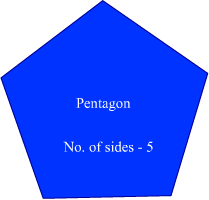 (c) Pentagon: (Penta means five) A pentagon has five sides and five vertices. 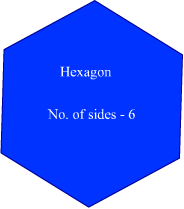 (d) Hexagon: (Hexa means six) A hexagon has six sides and six vertices. 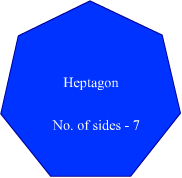 (e) Heptagon: (Hepta means seven) A heptagon has seven sides and seven vertices. x(f) Octagon: (Octa means eight) A octagon has eight sides and eight vertices. (g) Nonagon: (Nona means nine) A nonagon has nine sides and nine vertices. 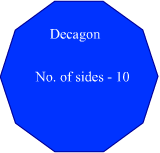 (h) Decagon: (Deca means ten) A decagon has ten sides and ten vertices. A line segments which connects two non-consecutive vertices of a polygon is called diagonal. An equilateral and equiangular polygon is called regular polygon. This means if a polygon has all angles equal and all sides equal is called regular polygon. For example – An equilateral triangle has all angles and sides equal, and hence is an regular polygon, A square is also a regular polygon. Polygon which has equal angles but not equal sides is called irregular polygon. For example – a rectangle has equal angles but not equal sides, and hence an irregular polygon. This is the combination of two Latin words; Quardi + Latus. Quadri – means four and Latus means side. Hence, a polygon with four sides is called quadrilateral. In quadrilateral, sides are straight and are of two dimensional. Square, rectangle, rhombous, parellelogram, etc. are the examples of quadrilateral. Similarly, angle sum of any polygon can be calculated.